Artist Phyllis Ginger's (1907-2005) first ambition was to become an illustrator and she was a prolific book illustrator and designer of book covers and pictorial advertisements. 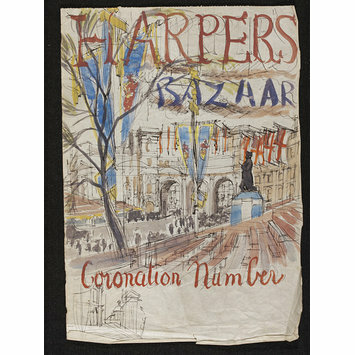 This design for a special Coronation Issue of Harper's Bazaar magazine (1953) reflects work for which she is best known, her topographical watercolour landscapes for the 'Recording Britain' project. Begun in 1939, the project's purpose was to recording aspects of British landscape that might be destroyed and lost under enemy bombing. 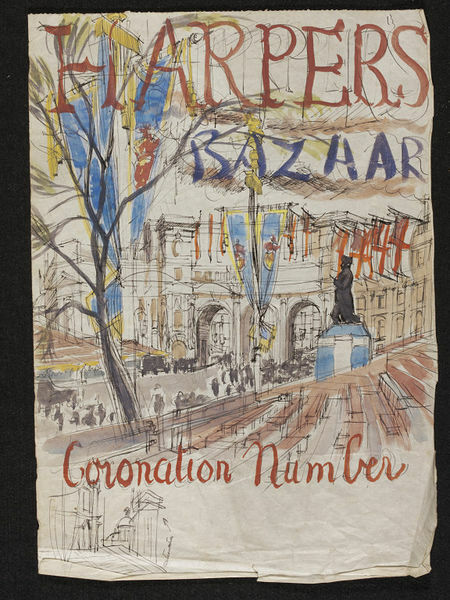 It was Ginger's skill as a topographical artist that led to her first commission as an artist, a watercolour of Chelsea Bridge, which was presented as a gift to the Canadian Prime Minister when he officially opened it in 1937 and during the war Ginger was also given permission to sketch the bombed streets of London. Another project that she became involved in was the Schools Prints scheme, which commissioned well-known artists to create lithographs that would then be printed and displayed in school classrooms. These usually featured scenes of British life and Ginger's contribution was a scene of Bristol Town Centre.